An Excursion to Juzcar and Setenil de las Bodegas. Something different. Juzcar, “Aldea Azul” (formerly known as The Smurf Village), is a blue village, very contrasting from the white pueblos of Southern Spain. 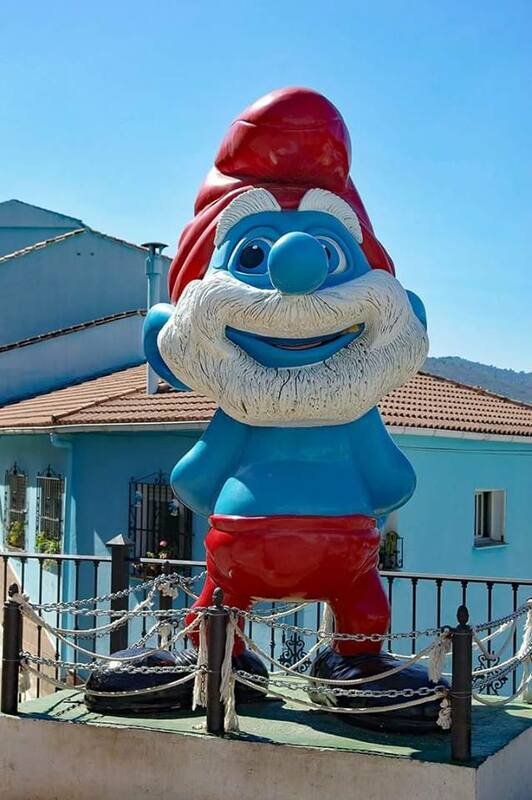 You will have time to have your photos taken with the smurfs, a wander around the village , a drink in the local bar and buy some blue wine…if you wish. This sleepy village was chosen by Sony Pictures because of its long mycology traditions. Every autumn, the area surrounding the village is covered with all types of fungi, making it a real paradise for nature lovers and mycologists. We then drive to Setenil de las Bodegas, ” The Flintstone Village”. Houses and shops here are built under rock. Free time to eat in one of the bars or restaurants, wander around the village. Understand how these buildings built into the cliff face have expanded between the boulders and under the overhang of rock over the years. which shelters this village from the Spain’s sun. Price 17.50€ Payment can be made by Paypal.